A great artist shared this touching story with me, I know it will touch you, thank you Nancy Radzik! Having four visiting family members, my wife was very busy, so I offered to go to the store for her to get some needed items, which included light bulbs, paper towels, trash bags, detergent and Clorox. So off I went. I acknowledged her and continued to talk to Denny for several more minutes about summer, bicycles and school. I watched his brown eyes dance with excitement, because he was the centre of someone’s attention. He then abruptly turned and headed toward the toy section. She was silent for a second, then with a tear in her eye she asked, “Who are you?” Without thinking I said, “Oh, I’m probably just a dandelion, but I sure love living in God’s garden.” She reached out, squeezed my hand and said, “God bless you!” and then I had tears in my eyes. May I suggest, the next time you see a BLUE ROSE, whichever differences that person may have, don’t turn your head and walk off. Take the time to smile and say Hello. Why? Because, by the grace of GOD, this mother or father could be you. This could be your child, grandchild, niece, nephew or any other family member.What a difference a moment can mean to that person or their family. From an old dandelion! Live simply. Love generously. Care deeply. Speak kindly.Leave the rest to the powers that be. If this story touched you today, please consider sharing it with others. It’s a good one and don’t we hear or read enough awful ones’ that this makes a good change? 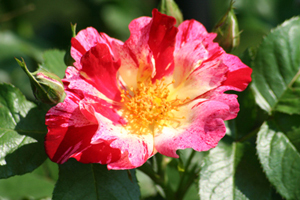 New story today- read about roses and slavery!